One of the easiest ways to cook up tastier food is to add more herbs and spices. One of the cheapest ways to buy herbs and spices is to buy them in bulk. I recently filled up several of my herb and spice jars at my local food co-op, the PCC. See photo above. I also recently cooked with all of them, which is why they aren’t all the way full (they were full when I bought them). 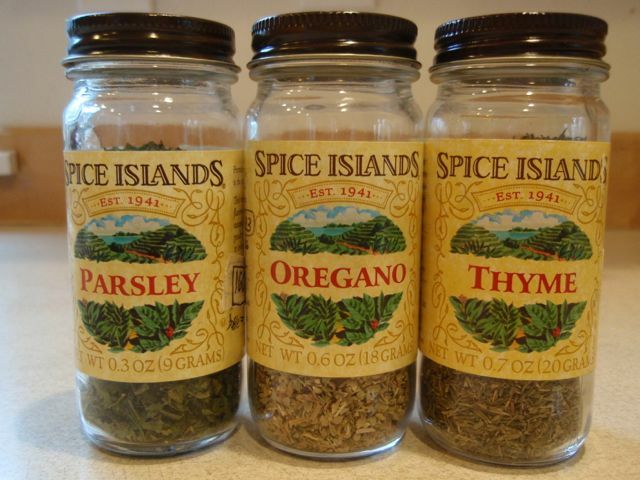 On Amazon.com, a 0.7-ounce jar of Spice Islands brand thyme costs $9.16. Crazy! At the PCC, I filled up the same jar with thyme for only $1.22. Even crazier, a 0.3-ounce jar of Spice Islands parsley costs $7.58. How much did my bulk parsley cost? 43 cents. Last but not least, you will probably pay $6 for 0.6-ounce jar of oregano. Highway robbery! How much did I pay for the oregano in bulk? 28 cents. Yes, hello, 28 freakin’ cents. If I had bought these online or at the grocery store, it would have cost me $22.74. Buying them in bulk cost me $1.93. That’s a savings of $20.81. That’s enough to buy a ton of vegetables or a really beautiful flank steak to cook with the herbs. Making one small change to the way you shop can save you a ton of money. Also, bring your own jars. That way you can buy just the right amount of herb or spice to fill your jar and you don’t have to waste more plastic or paper bags or twist-ties. All you have to do is go up the cashier and have them weigh the jar for the tare weight. Mark this on the jar. For example, this jar’s tare weight is .26. 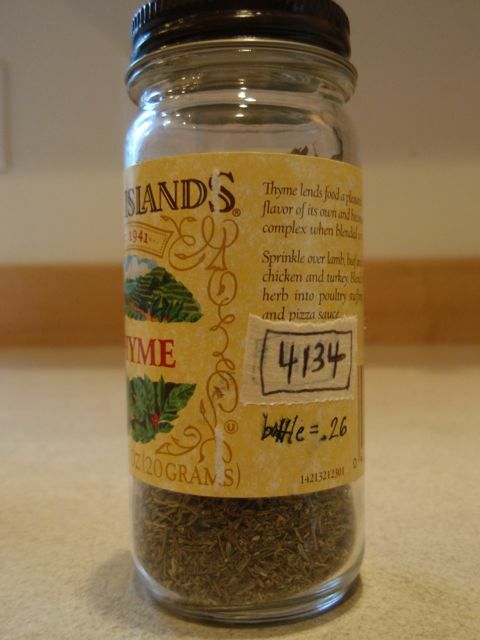 FYI, 4134 happens to be the code # for bulk thyme at the PCC. When the cashier rings up your herbs and spices, he or she will subtract the tare weight from the gross weight so that you are only paying for the actual herb or spice and not the jar. Easy-peasy! And by reusing your jar, you’re helping the environment. By the way, if you don’t have spice jars, buy empty ones in the bulk aisle (convenient, isn’t it?) at most grocery stores or at your local Goodwill or secondhand store. They will cost 50 cents to $1-2 each, which is a lot less than buying a new bottle of herbs or spices. So next time you’re running low on seasonings, go SUPER FRUG and take your jar with you to the grocery store to buy your herbs and spices in bulk. Your taste buds will thank you and so will your wallet! ps. Even though I’ve been buying herbs and spices in bulk for years, bringing my own jars to refill at the store was inspired by Bea Johnson’s book, Zero Waste Home.